Luton Town’s exciting U18 forward Connor Tomlinson can be ‘as good as he wants to be’ according to first team coach Joaquin Gomez. 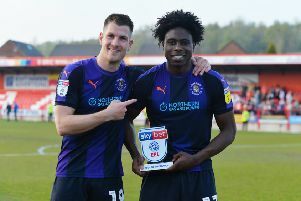 Hatters The promising attacker gave further notice of his talents by netting twice for the youth team in their 2-0 EFL Youth Alliance South-East Division win over Barnet on Saturday. On Tomlinson, who is the club’s youngest ever player and impressed in the recent 2-0 pre-season friendly win against Bedford Town, scoring both goals, Gomez said: “He works really hard and that’s one of his main strengths. “He’s got things he needs to improve and I think he’s focused on that. “He’s working with his coaches to improve that, and every time that he comes with us, we try to push him and make sure he gets to a standard that he needs to be closer to the players that we’ve got. Every time that he comes with us, we try to push him and make sure he gets to a standard that he needs to be closer to the players that we’ve got. At the weekend, the visitors had a man sent off for a late challenge in the 27th minute. Tomlinson opened the scoring in the 67th minute, blasting into the top corner from the edge of the area after receiving a pass from Ricco Grecco. The striker then netted his second with 10 minutes to go, following up to smash in from eight yards out after his initial header from Corey Panter’s corner was blocked. The drama wasn’t over, however, as goalkeeper James Holden came on to replace Tiernan Parker in the 85th minute, saving two penalties after the first one was retaken. Luton visit AFC Wimbledon U18s this weekend. Hatters: Parker (Holden 85), Jones (Wilson 30), Grecco, Byron, Panter ©, Eytle, Richardson, Boorn, Newton, Tomlinson, Wilson. Subs not used: Nicolson, Wedd, Weyman.